The hey-day of the "Jesus Seminar" was from the mid-1980's to the early 1990's. In my Apologetics and Worldview class I lectured on the Jesus Seminar. The students had to read Craig Blomberg's essay critically interacting with the Jesus Seminar: The Seventy-four "Scholars": Who Does the Jesus Seminar Really Speak For? Even though the Jesus Seminar is not the head-line grabbing entity it once was Blomberg's essay is worth reading in that he mentions a number of assumptions used by much of non-evangelical scholarship that should be challenged. One of these concerns the fluidity of the oral history between the time of Jesus and the first written Gospels. 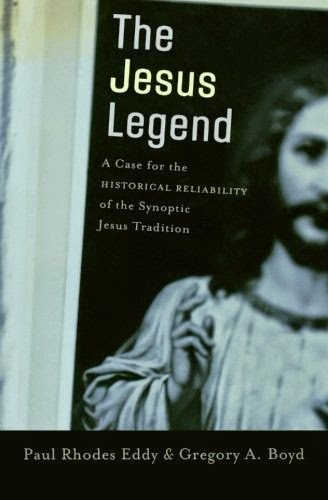 I explained this in class today and mentioned the work of Paul Rhodes Eddy and Gregory A. Boyd The Jesus Legend: A Case for the Historical Reliability of the Synoptic Jesus Tradition which looks at this issue. Below are the notes I handed out in class today. It's not a full analysis but a few introductory thoughts. i. O1: In the oral transmission of Jesus’ words, his disciples remembered only the core or gist of his sayings and parables, not his precise words. ii. O2: The bedrock of the sayings tradition is made up of single aphorisms and parables that once circulated independently. iii. O3: The simpler forms of sayings and parables are more likely to be original with Jesus. iv. O4: Hard sayings are frequently softened in the process of transmission to adapt them to the conditions of daily living. v. O5: Words are frequently borrowed from the fund of common lore or from the Old Testament and put on the lips of Jesus. ii. N2: Quoted speech that is entirely context-bound is probably the product of the storyteller. ii. W4: The evangelists frequently compose or revise and edit both sayings and narrative contexts to make them conform to their own individual language, style, or viewpoint, or to make saying and context conform to each other. iii. W8a: Sayings and parables expressed in “Christian “ language are the creation of the evangelists or the oral tradition before them. iv. W10: Sayings and narratives that reflect knowledge of events that took place after Jesus’ death are the creation of the evangelists or the oral tradition before them. b. “The theory that sayings, aphorisms, memorable oneliners, and sometimes parables are the things that survive, whereas stories about Jesus, with his words embedded within them, do not, is clearly promulgated with one eye on the results. ‘It is highly probable,’ we are told—this, recall, at the introductory level, before we have examined a single saying!—that the earliest layer of the gospel tradition was made up almost entirely of single aphorisms and parables that circulated by word of mouth, without narrative context—precisely as that tradition is recorded in ‘Q’ and Thomas. “With the evidence thus well and truly cooked in advance, it is not surprising that the portrait of Jesus-the-quizzical-sage ‘emerges’ from the subsequent discussion. It could not help doing so. The theory about what sort of material survives in oral tradition, I suggest, was designed to produce exactly this result. 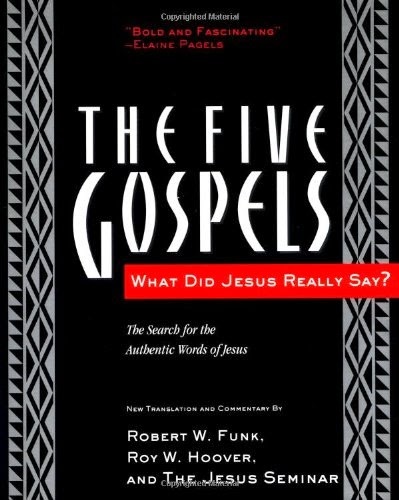 Robert W. Funk (with Mahlon H. Smith), The Gospel of Mark: Red Letter Edition (Sonoma, Cal. : Polebridge Press, 1991), 35-38. Paul Rhodes Eddy and Gregory A. Boyd, The Jesus Legend: A Case for the Historical Reliability of the Synoptic Jesus Tradition (Grand Rapids, Mich.: Baker, 2007), 237-306. The Gospel of Mark: Red Letter Edition, 119. The Gospel of Mark: Red Letter Edition, 48. The Gospel of Mark: Red Letter Edition, 137. The Gospel of Mark: Red Letter Edition, 41. The Gospel of Mark: Red Letter Edition, 42. The Gospel of Mark: Red Letter Edition, 44. N. T. Wright, “Five Gospels But No Gospel: Jesus and the Seminar” in Crisis in Christology: Essays in Quest of Resolution (ed. William R. Farmer; Truth Incorporated, 1995), 140. Wright, “Five Gospels But No Gospel,” 141. Eddy and Boyd, The Jesus Legend, 273-274. Richard B. Hays, “The Corrected Jesus,” First Things (May, 1994), 46.